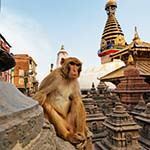 Our Maldives and Nepal holidays combine sightseeing in fascinating Kathmandu, with a flight over the snow-capped Himalayas Mountains and a thrilling tiger safari in Chitwan National Park. Afterwards fly to the spectacular Maldives and relax at a luxury hotel on a pristine turquoise coral atoll, with some of the best snorkelling & diving in the world. Tiger safari, Himalayas flight & all transfers & included. Transfer to Kathmandu Airport for your onward flight.